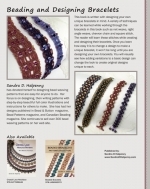 This ebook is written with designing your own unique bracelets in mind. A variety of techniques can be learned while working through the bracelets in this book; such as net weave, right angle weave, chevron chain and square stitch. 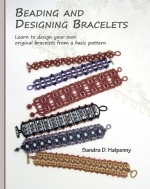 The reader will learn these stitches while creating and designing their bracelets. Once you learn how easy it is to change a design to make a unique bracelet, it won’t be long until you are designing your own bracelets. You will visually see how adding variations to a basic design can change the look to create original designs unique to each.